UPDATE: Two men who robbed a Gore Highway service station yesterday morning are still on the run. Police are appealing for information after the men, wearing thongs and high-vis shirts, robbed the Southbrook business about 1am. One was armed with a shotgun, while the other had a hammer. A single shot was fired into the shop door. The pair left in dark coloured Ford Falcon sedan which was last seen driving towards Pittsworth. YESTERDAY: Two armed men wearing thongs and high-vis shirts are on the run after robbing a Gore Highway service station at Southbrook early this morning. The men, one armed with a shotgun and the other with a hammer, forced their way inside the United Fuels shop about 1am before demanding the male shop keeper hand over money and cigarettes. A single shot was fired into the shop door before the pair stormed inside. 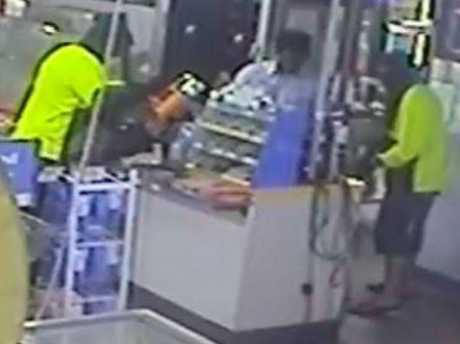 Security footage shows the bright flash of the gun just seconds before the pair ran into the shop where the worker, who appears to remain calm in front of the robbers, stuffs money and cigarettes into a bag. Detective Senior Sergeant Paul McCusker said that the men had their faces covered and had weapons with them suggested the robbery was planned. "These people have gone to extreme lengths to first discharge a round we will allege into the door to allow them to get inside and then smash the door with the hammer," Detective Senior Sergeant McCusker of the Criminal Investigation Branch said. "Irrespective of what type of firearm it is, it was discharged so we remind members of the public not to approach this vehicle if seen or these people if known, but to contact police." The vehicle is a dark coloured Ford Falcon sedan and was last seen driving towards Pittsworth. Southbrook armed rob: Det Sen Sgt Paul McCusker on the armed robbery at Southbrook. EARLIER, 7.30AM: Two men are on the run after blasting a shotgun through a service station door in an armed robbery early this morning. 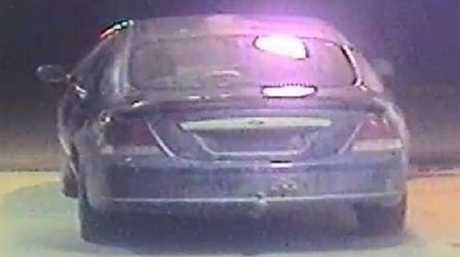 Security cameras show two men driving a dark coloured Ford Falcon sedan to the United Fuels service station on the Gore Highway at Southbrook shortly after midnight. The men had their faces covered at the time. One of the men, armed with a shotgun, shot a large hole through the locked front glass doors before the pair forced their way inside. A male employee was threatened as the men demanded he hand over cash and cigarettes. The employee complied. The pair fled with a sum of cash and cigarettes. The dark coloured sedan - the colour unknown at this stage - was last seen driving towards Pittsworth. Police have appealed for any witnesses in the area at the time to come forward, as well as anyone with dash cam footage, to contact police. The male shop worker was not injured in the robbery.